Well there's snow on the ground and the temperature's pretty low, so we can pretty solidly declare that winter is upon us. 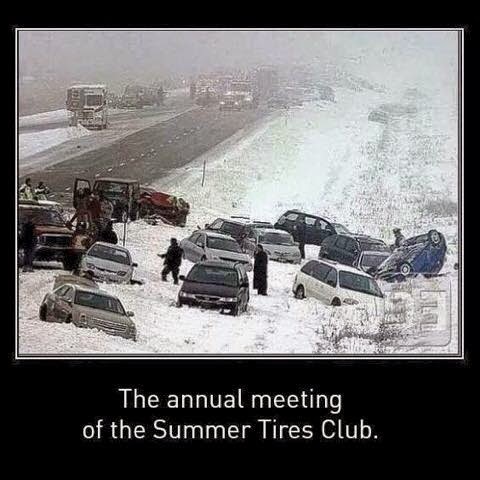 And with wintry blizzards comes one of the great Canadian traditions: changing over your summer tires for winter tires. If you're anything like me, you probably waited until just after the first major snowfall to remember to put them on. This often ends up with you driving around dangerously for a week waiting for your appointment, all the while dodging other summer-tire skidders. It's a fairly dangerous and unpredictable way to go about driving. Recently I tried looking up recommendations for when to put on your tires and came to an interesting discovery: almost every single source recommends to put them on once the temperatures dip below 7 degrees Celsius. Everyone from the tire producers to the Tire and Rubber Association of Canada agrees with this fairly precise temperature recommendation. Why? Turns out that summer tires are made of a different rubber that gets quite stiff below 7 degrees, and reduces the friction of the tires (the comparison that was used was that they approach the consistency of a hockey puck). Winter tires become more effective below 7C, even on dry clean pavement. If you're looking to drive as safely as possible (which you should, seeing as road injuries are the 9th leading cause of death worldwide), it might not be quite enough to just wait until the forecast predicts a temperature below 7, seeing as it often takes time to book an appointment and by that point it could be a bit late. 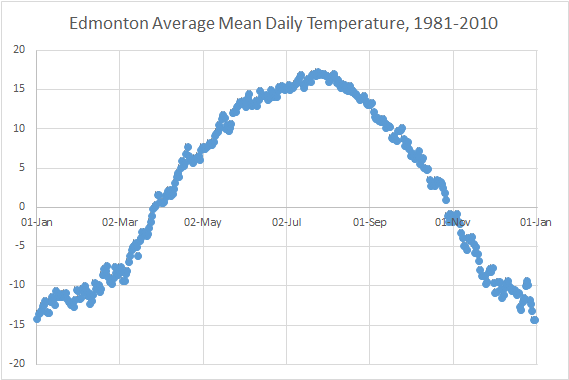 Fortunately, Environment Canada has the daily temperature for various cities over the past several decades all neatly stored online. Once you have this, it's fairly straightforward to choose when to put on your winter tires. If you were willing to accept a 50% risk of being ill-equipped for the weather, you'd be looking to put them on sometime around the beginning of October, and take them off around the beginning of May. That's vastly longer than I typically have mine on for, and I suspect that's the same for many people. 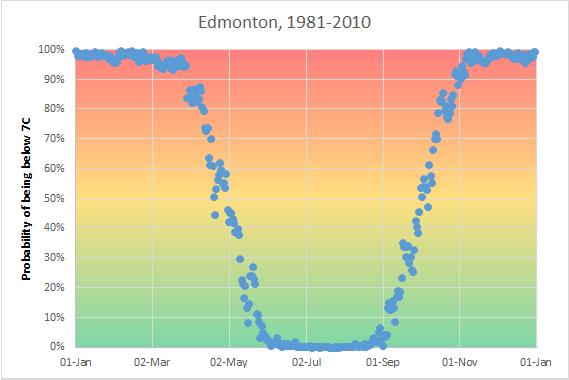 In total, an Edmontonian ought to have their winter tires on by October 1st, and leave them on for 210 days (at least seven months of the year!). Of course, a 50% risk of having the wrong tires might seem a bit high for some people. 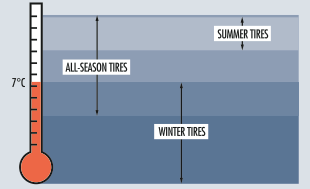 If you were only willing to accept a 10% risk, you'd be looking at 261 days of winter tires starting September 4. 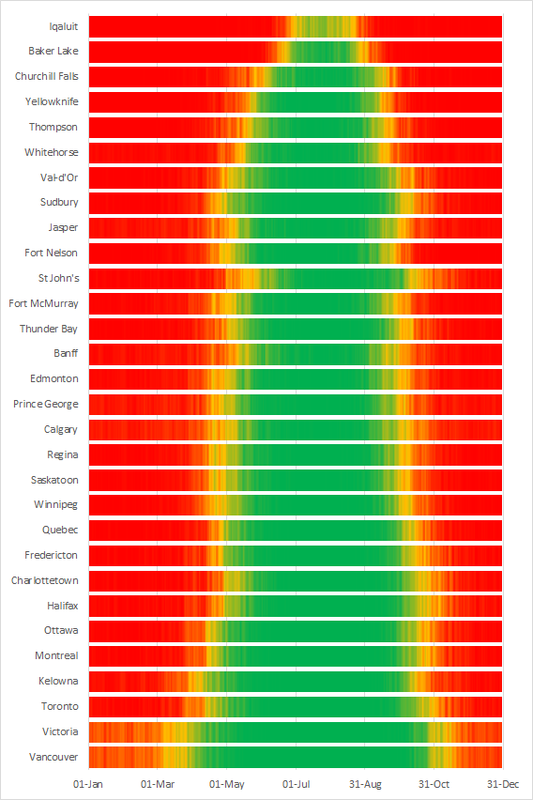 Unsurprisingly, the northern territories tended to need winter tires more than the southern provinces (quite frankly, it's not worth taking winter tires off if you live in Iqaluit). What might be surprising to some is that even the warmest parts of the country, that hardly ever see snow, ought to have proper winter tires on for at least a third of the year. 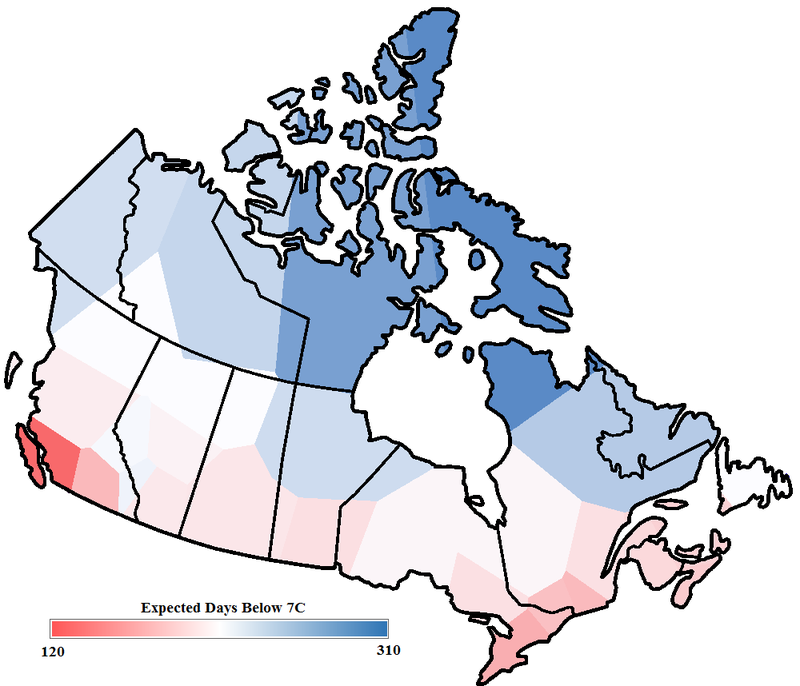 Where green means 0% chance of being below 7C, and red means 100%. One final thing to note: only the province of Quebec has legal requirements for winter tires, with the exception of some British Columbia highways. These legal requirements fall way outside of the 7 degree recommendation though. It's all well and good to have laws for additional safety when operating motor vehicles, but if they fail to capture the designed temperature ranges of the actual tires, it seems like a bit of a missed opportunity. What a great article! Very informative! I think you mean expectedly instead of unexpectedly when talking about winter tire usage in the north. That's really interesting! Most, if not all, highways in northern BC require vehicles to have winter tires from October 1 until April 1, which fits pretty well with the 50% risk time period for Fort Nelson. I've always considered to be a pretty wide span, but it's good to know that's fairly accurate!